At OPTrust we strive to provide our services in a way that respects the dignity and independence of people with disabilities. We are committed to giving all people, including those with disabilities, access to services with the same quality and timeliness. 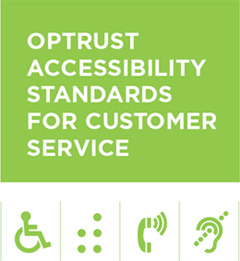 Our Accessible Customer Service Policy outlines how OPTrust provides services that are accessible to all persons. The policy is intended to benefit the full range of people with disabilities, as defined in the Ontario Human Rights Code. Whether a person’s disability is apparent or not, everyone should be treated with courtesy, made to feel welcome, and have their need for accommodation respected whenever they interact with OPTrust. This policy is available in alternative formats upon request. Please let us know how we are doing. If you wish to provide feedback on the accessibility of our services contact us.